Tag Archives for " New Vaporizer "
Vaping has turned the tables on tobacco manufacturers and they do not like it one bit. Cigarette sales are declining while that of electronic smoking devices is rising. The tobacco industry is shuddering because the makers of vaporizers are encroaching on their market. Although it’s not the not the end all and be all solution to stop smoking, vaping paves the way to eventual quitting. The new Firefly 3 vaporizer is a highly anticipated device. These days, you see more people holding vaporizers instead of cigarette sticks. Most of them are former cigarette smokers who have curbed the craving for nicotine. They are also jubilant after discovering that vaping is a safer substitute. That is the real upside. If you are new to vaping, the initial query is usually about the main device. 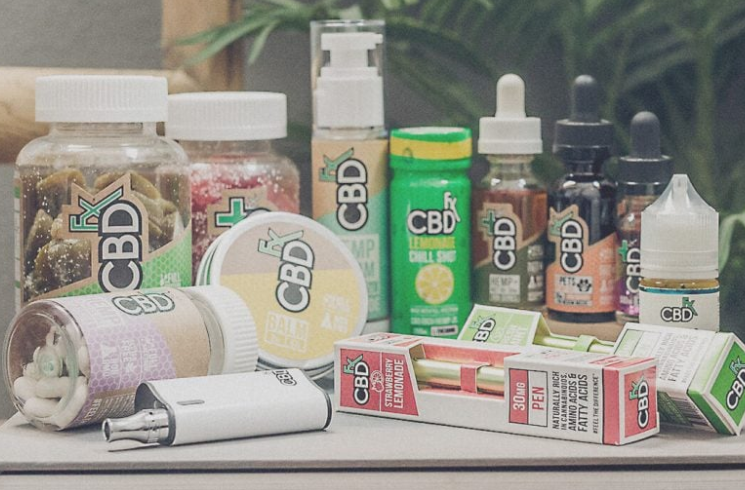 You’ll be overwhelmed by the wide selection of vaporizers available in the market. The portable vaporizers are the most popular with ‘vapers.’ But users have become picky. The vaping device should be able to provide the best vaping experience. A vaporizer can be rated superior to others if it can produce the best tasting and strongest vapor. How else can you delight in vaping if you can’t derive super vapor quality from the device? 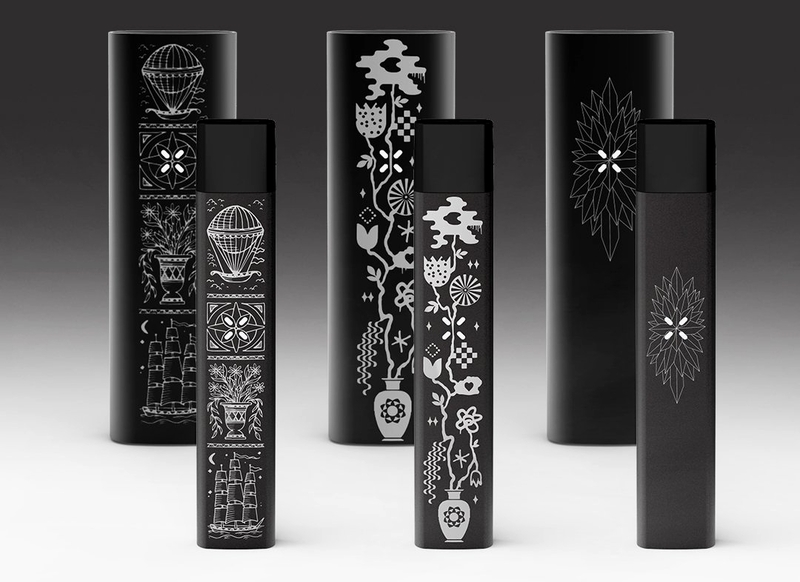 Many portable vaporizers can catch your fancy because of stylish designs and outlandish appearance. However, if you examine closely, you won’t miss the poor workmanship quality. A good vaporizer should be durable enough to last as long as 5 years minimum with normal use. The established manufacturers extend a generous 5-year, 10 year, or life time limited warranty that covers the device and its accessories against defects and/or workmanship except for batteries. A vaporizer is a hefty little investment so it would be a waste if you spend on cheap brands that obviously won’t last and perform as expected. Heat-up time is what separates the best vaporizers from the second-rate. To illustrate, the Firefly brand is well-known because it uses an all-glass heating chamber. Such instant heat characteristic is unique. It can’t be found in other vaporizers. Firefly has produced the best vaporizers thus far. Vapers are eagerly anticipating the launching of the new Firefly vaporizer. The vaporizer heats up in no more than 3 seconds by simply ticking the built-in touch sensors. Temperature can reach 400 degrees F in no time at all. You should see the warm glow from the heating chamber when the temp reaches the max. High-quality vaporizers are generally easy to clean and maintain. A user needs minimal effort to clean the vaporizer on a regular basis or after every use. The vaporizer will be in good working condition when there is no build-up of residue. Sometimes, the lack of proper upkeep will weaken its functionality which can’t be blamed on the manufacturer. Therefore, it is suggested that users perform periodic cleaning, especially within the warranty period to prevent voiding. If you want fresh vapor every time, your vaporizer should be clean. None of the above qualities would matter if the device isn’t easy to use. Again let’s use the Firefly vaporizer as an example. You can’t help but be amazed at its exceptional engineering. All you need to do is place your fingers on the touch sensor to ignite it. No power button, just instant vaping session and relaxation. On top of that, Firefly vaporizers can be operated using your smartphone. Just download the Firefly app and you’ll have a free hand in choosing 6 heat settings and control temperature as you deem fit. Firefly is an established and pioneering brand. There’s really no need to keep mentioning the name because it’s already a by-word in the industry. Firefly vaporizers carry all the qualities of a good vaporizer which are indisputable. In fact, the vaping world is already filling with excitement because the Firefly 3 vaporizer is about to stir the market again. Some contend that vaporizers shouldn’t cost that much. However, the price is relative. It’s neither cheap nor expensive. But for someone who’s in the market for the most effective vaporizer, the choice will always be the product whose benefits are worth more than the actual cost. 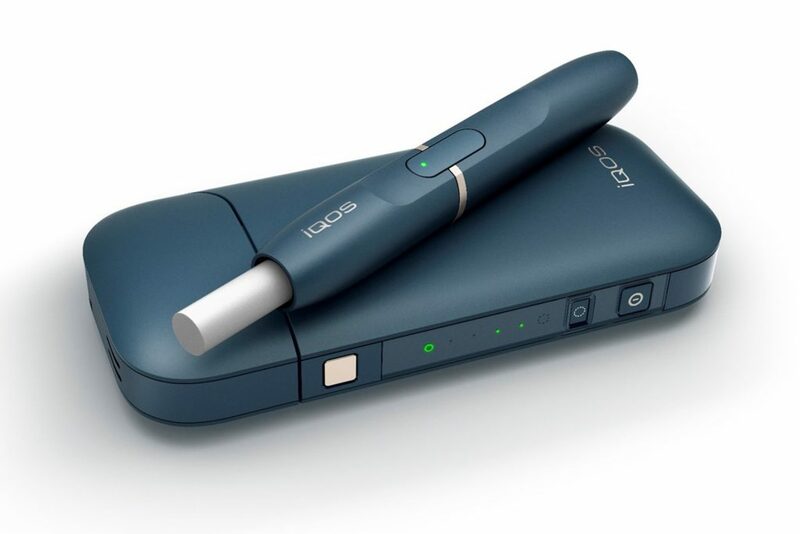 A new type of vaporizer called the IQOS vaporizer has been designed that is a cross between a vaporizer and a cigarette. The IQOS vaporizes inserts that have actual dried tobacco in them which removes the need for combustion. If you are new to vaporizers you may find it helpful to read our comprehensive vaporizer guide to learn what type of device might be be suited for your needs. To learn more about the IQOS vaporizer continue reading our review article below. The IQOS vaporizer is an interesting concept that will definitely cater to some people more than others. It is not a 'vape' since vapes are designed to vape liquids and its not a normal vaporizer with a oven chamber that you load in your own dry herbs, tobacco, or concentrates either. The IQOS is designed to work specifically with tobacco inserts that look very similar to a normal cigarette. We can't say that the IQOS is a healthier alternative legally but without using combustion one can assume that less harmful chemicals are extracted from the material being heated. Looking at the build quality of the IQOS tobacco insert system it is pretty well made. 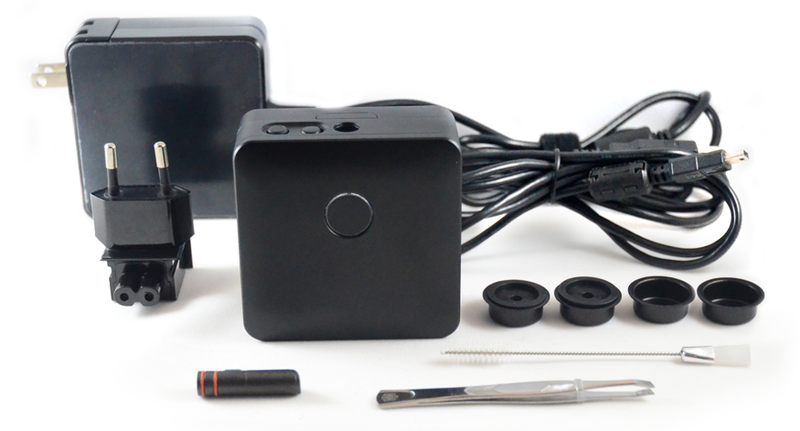 The system includes the charging box, the battery and heating system, and the inserts that go into it. To use the IQOS you take one of the cigarette style inserts and you place it into the top of the battery heating mod. The insert stick out a bit and this is the part where you place your lips on and it acts as a mouthpiece. This cigarette like insert feels like the filter does with a normal cigarette. I think this was an important feel to accomplish in the product to help people who are having difficulty quitting smoking. The more the entire process resembles a traditional smoking experience the easier and more natural it will be for some people to commit to the change and enjoy the experience. The IQOS vaporizer is a simple easy to use device that maintains a temperature of around 350°C and automatically turns off after 6 minutes of use. You can turn it back on to continue using it if your session is not complete. You will be able to continue inhaling until the taste and vapor is no longer present. The battery that is built into the actual mod and heating chamber is pretty small and will likely only get teh average user about 1 session, at which time you will need to place it back into the larger part of the system which will charge it back up for another session. The bigger battery box is able to recharge the smaller mod/heating chamber about 20 times before it itself needs to be recharged. IQOS is about the same size as a pack of cigarettes and a lighter so ultimately you are carrying the same sized dimensions around with you. If you know that you will only be needing one insert than you can just carry the mod/heating chamber with you, but the insert I think should really only be put in place before use or it could get damaged. The IQOS vaporizer is an interesting concept and one that I think will benefit some people more than others. Overall the build quality is pretty good and the draws you get are very similar to that of a traditional cigarette. Having said that, I personally am a fan of normal vaporizers since they can be used for a much longer period of time and do not require inserts nor a external battery charging system. Regular dry herb vaporizers can be used with tobacco leaf already, so this might be something worth looking into. If you are wanting to check out some of the newest vaporizers you can read our article on that here. One of the most popular vaporizers on the market is the PAX brand of portable vaporizers. The Utillian 721 vaporizer for dry herbs is one of the best deal you will find under the $200 price point that is also comparable to the upper tier devices. The Utillian 720 was released about a year ago and since this time the device has become one of the more sought after mid price ranged units. The Utillian 721 vaporizer has a few upgrades over the 720 and is still priced the same. The Utillian 721 vaporizer is a convection vaporizer meaning that it uses forced air to efficiently and evenly vape your materials opposed to conduction heating which vapes less evenly and tends to combust your material more often. The Utillian 721 vaporizer is a solid deal and one of the best vaporizers﻿ under 250 that we've tested, that just happens to also use convection heating. The Utillian 721 has 8 pre set temperature settings that all fall onto the ideal settings for optimal performance. The Utillian 721 comes with four base heat settings of 170C, 180C, 190C, 210C and each of these four settings has boost mode where you can bump each up 5 extra degrees. So a total of 8 different temperature settings that can easily be selected and enhanced. 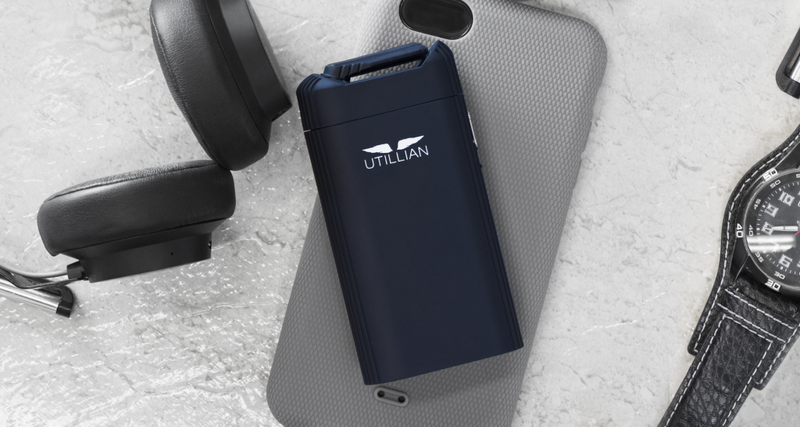 The Utillian 721 vape uses convection heating opposed to conduction. A new type of vaporizer called the Loto Lux vaporizer has recently introduce induction heating as well which may give convection heating methods some real competition. The 721 Utillian is an affordable high performing vaporizer that delivers smooth hits and great vapor quality and density. You may also be interested in looking into a budget friendly dry herb vaporizer called the Utillian 420 if the 721 is out of your price range. The Utillian 721 has a very simple to use design that anyone can pick up at start using and having fun with. The device has just one button which controls the on/off and temperature modes including the boost performance mode of each temperature setting. The button is positioned where your thumb will likely be holding the device to make it feel very natural in your hand to operate. The Utillian 721 falls into the goldy lock zone - meaning it is not to big and not to small, it is a great size and easily fits into your pocket. The Utillian 721 has a good weight to it and feels as it should - durable quality built. A big pet peeve for many portable vapes is the weak battery life that you get on each individual charge. 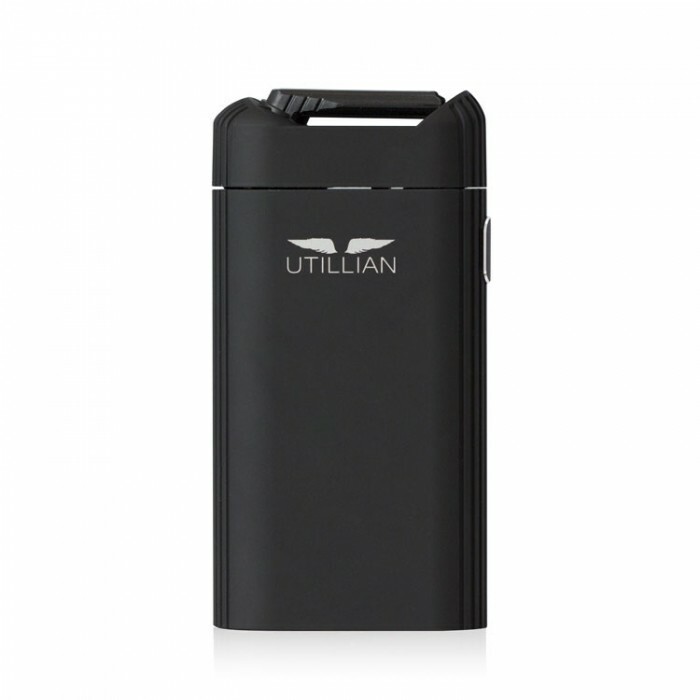 You will be happy to know that the 721 Utillian vaporizer has a 90 minute of use battery. This is 15% stronger than the 720 and around double the amount of vaping time on a charge from other industry leading convection vaporizers. Another nice feature that you get with the 721 is the magnetic mouthpiece cap - a magnetic mouthpiece allows for very quick and easy loading as well as protects your device from components getting damaged due to less moving parts. We have a few places that we recommend you buy the Utillian 721 vaporizer. We suggest that you either visit the official manufacturers website which is in the link below this paragraph. If you are in Canada a good place to make your purchase to receive faster shipping and perhaps save on border taxes is TVape (toronto vaporizer) using the link below to buy with a free gift. The new Haze Square Vaporizer is soon to be released and by the looks of it will exceed our expectations on build quality, features and user experience while costing only a fraction of what we expected it to cost. Haze is known best for making one of the most versatile and innovative products on the market with their Haze Dual V3 device released a few years ago. The New Haze Square Vaporizer (noted on the packaging as Haze² vaporizer) is set to be released any day now. We expect this device to compete heavily with devices that are priced in a much higher category than the Haze vaporizer. The Haze Squared will be on the same level as the Firefly 2 and PAX 3 vaporizers. Continue reading our Haze Square review below to learn more about this newly introduced portable vaporizer. The New Haze Square Vaporizer is the very first and only quad (4) chamber vaporizer that you can purchase. This 4 chamber functionality means that you can have your next 4 sessions loaded and ready to go. Not only can you have your next four sessions loaded, you can have a mix and match of the different mediums that you wish to vape. This means that you can have dry herb in one chamber, wax concentrates in another chamber, and e-liquids in yet another chamber, all while still having a fourth chamber to still load. The Haze Square utilizes on demand convection heating that uses the movement of air instead of direct heated touch to vape your materials. Convection heating is a more efficient and more evenly distributed heating method than what most portable vaporizers use. Most portable vaporizers use conduction heating, to see such a small device like the Haze Square use convection style heating is quite impressive. The on demand heating allows for very little to no wait time between your draws. In order to switch from one chamber or one material to the next you just need to twist the chambers like a clock to place the next one over the heating element. You are able to twist the dial located on the back of the device very easily to seamlessly switch from one oven chamber to the next. The Haze Square features adjustable temperature from 340F – 450F, on demand vapor, convection heating, compatible with e-liquids, wax, and flower, has 4 chambers for 0 down time between sessions, pre packable material pods, removable parts for easy maintenance, smart temperature controls, and a 10 year warranty. A mouthpiece, 2 dry herb pods, 2 concentrate pods, 1 wall charger, 1 UK outlet adapter, 1 micro USB charging cable, 1 cleaning tool, 1 dab tool, and the user guide. The new Haze Square quad oven on demand vaporizer is set to be released in 2017 and could become available any day now. In talks with the manufacturers they said the product is ready along with the product packaging and accessories. We expect this news to come available any time now and we are very excited to test the final version for the Haze Square. 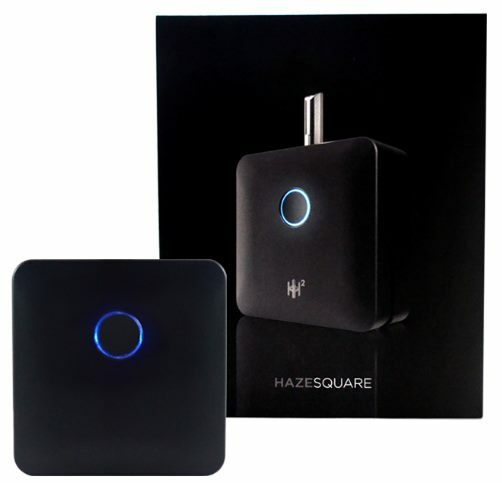 News about the Haze Square was first released almost a year ago and the company has been making sure the device meets all their requirements and exceeds customers expectations. You will be able to get your Haze Square vaporizer by visiting the official Haze website here, once available. The Hydrology9 vaporizer is a dry herb vaporizer that uses liquid filtration to add an extra layer of filtering to the vapor path. The vaporizer industry is one of the fastest growing industries in North America. The Hydrology9 is available to purchase online and ships to most countries around the world. 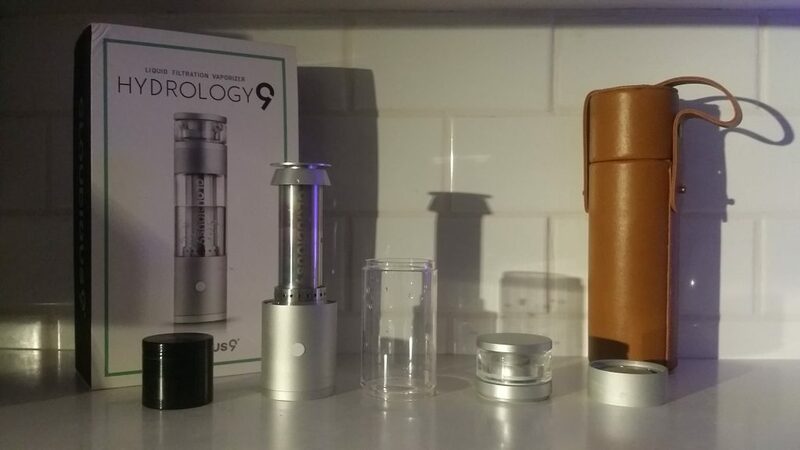 In this article we will be taking a closer look at the Cloudious9 Hydrology9 to see how the build quality, vapor quality, ease of use, portability, and overall customer experience stacks up against other popular devices in the industry. ​A new component is now available for the Hydrology9. Enhancing on the overall build quality and durability of the device is a new acrylic glass foundation. For those of you who tend to be a bit clumsy or who want to bring the Hydrology9 on outdoor adventures, this will prove necessary. The regular glass cylinder that comes included is great for luxury, but let's face glass can break. This new acrylic component is nearly indestructible. If you are one of the unlucky few who have dropped and broken the glass component than you are a sure candidate for this accessory.​ You can pick one up here. The Hydrology9 vaporizer in my opinion is one of the most well designed vaporizers with the best quality parts. The Hydrology9 is required to be built with more precision than other vaporizers because it needs to operate with a large volume of water flowing through its center. The borsilicate glass tube that takes up the larger surface space of the device needs to be made with precision. The glass tube needs to be a perfect fit between the base of the unit and the top of the unit. As we mentioned above there is also the option to pick up the acrylic glass component for improved durability. Built to be tough against one of natures most weathering compounds. The spacecraft aluminum housing is rust proof. The housing of the Hydrology9 vaporizer was chosen because it was the best material for the job. The housing it what gets tightened on either side of the borsillicate glass tube to create a water-leak seal. This design allows for easy maintenance and fresh water to be added very quickly. 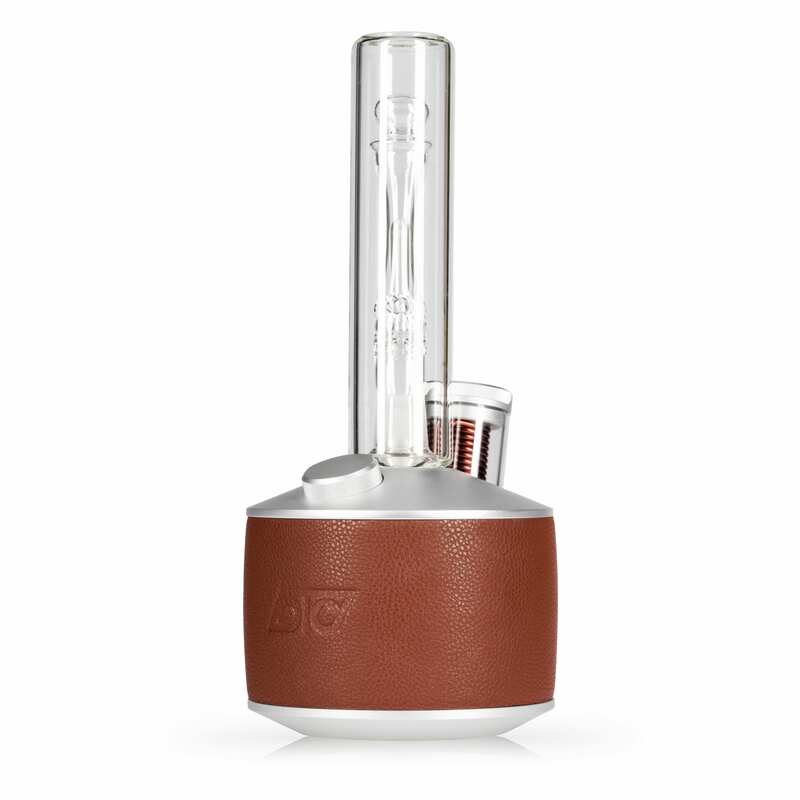 On top of the Hydrology9 vaporizer you will find the lid which connects to the glass mouthpiece with a magnetic connection. The magnet connection holds on tight and works well for a few reasons. using the magnetic connection helps to create a water-leak seal and prevents water from funneling through the mouthpiece. The lid also has no grooves in it and since only the magnet holds it in place it is very easy to keep clean. Carrying cases are the perfect companion product for many types of electronic devices. 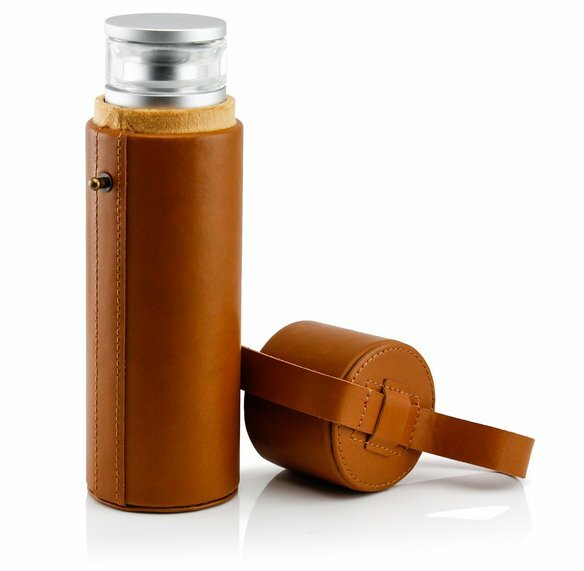 In the image below you will see the snug fitting custom made leather protector carrying case for the Hydrology9 vaporizer. This case keeps the Hydrology9 safe and has no wiggle room. Overall the attention to detail and the original design of the Hydrology9 vaporizer is of high quality. The size and weight of this unit feels extremely tough and solid in your hands. I have tried squeezing the glass tube as hard as I can in my hands to see if it would break. Fortunately for me it seems to be very tough and did not break no matter how hard I squeezed. If you dropped the vaporizer and it landed on a rigid rock or solid surface it could break. In cases such as this you are able to purchase the individual components directly from Cloudious9. Vapor production and vapor quality are the two areas of focus that make the Hydrology9 such a unique dry herb vaporizer. 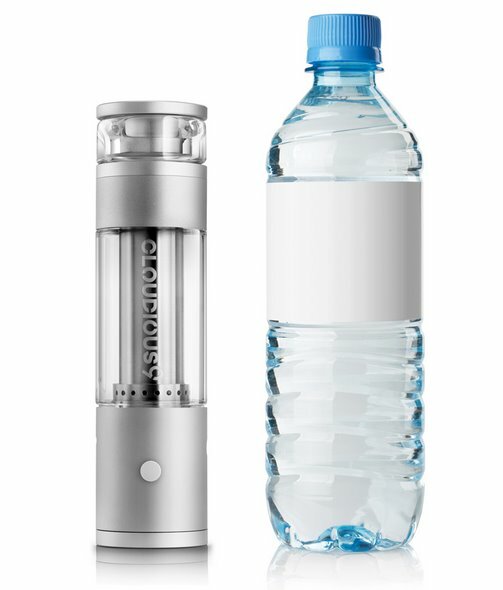 There are very few devices that use anywhere near the same volume of water that the Hydrology9 vaporizer uses. If you are using the Hydrology9 on one of the higher 2 temperatures in combination with only 20% water. You will be getting much more visible vapor that still has a bit of heat to it. If you use the Hydrology9 on one of the 3 lower temperatures and have about 70% water you will be getting a more flavorful draw with less visible vapor. The Hydrology9 vaporizer has 5 preset temperatures. These 5 temperatures are indicated by the 5 different LED colors that light up as you cycle through them. The highest temperature is set very close to the temperature of combustion. If you are looking for the most visible vapor you can achieve this by having the highest setting on with minimal water in the tube. In my opinion the 'Goldilock' zone where the vapor is not to hot and not to filtered was on the 'purple' heat setting. Purple is the second highest temperature. I found this heat setting to work well with about 45% water in the glass tube. Something I would like to see improved upon in the next generation of the Hydrology9 is the oven. As it stands the oven is not the best in the industry and could use some improvement. The Hydrology9 vaporizer is smaller than I originally thought. The image below gives a good indication of the actual size. I myself have done a bit of traveling with the Hydrlogy9 and brought it up to a friends cottage. The device is definitely a conversation piece and I've found that friends who would typically say no to a quick hit have done the opposite and asked if they could give it a try. The internal battery used by the Hydrology9 is a 2000 mAh lithium polymer one that is pretty good and seems to last quite a while. You can get over an hour of use or about 10 to 15 sessions on a full charge. 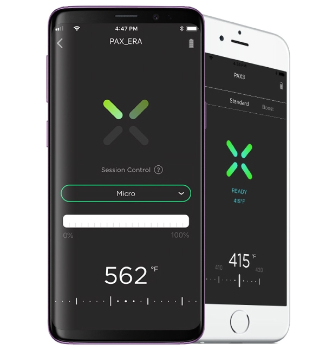 The device takes about 2+ hours to charge and reaches your set heat temperature after about 60 seconds when starting a session. Using just one button for all operations the Hydrology9 vaporizer is very easy to use. To turn the Hydrology9 vaporizer on you press the button 5 times and the same to turn it off. To cycle through the temperature options you just press the button once. When you first get the Hydrology9 vaporizer it is a good idea to plug it in and make sure that it get's up to a full charge. Second, you should power it on when its charged and run it through the hottest heat setting for a 2 minute cycle with not material in it. This will give it a good clean to help give it a fresh start. Located on the bottom of the Hydrology9 vaporizer is the oven lid. The oven lid has a built in stir stick that allows you to rotate your material while you are in the middle of your session. The Hydrology9 uses conduction heating which makes the stir stick an important component to help heat your materials more evenly. Keeping the Hydrology9 clean is important. You don't want to leave the water in for too long or it can get grungy. I personally change the water in mine about once a week. The water has never actually been that dirty when I go to change it but it just makes sense to put fresh water in it since its a simple process to do. The design of the Hydrology9 makes changing the water effortless. You just take off the magnetic lid, twist off the glass mouthpiece and poor the water out. To give the glass tube a clean you can unscrew the spacecraft grade aluminum housing and remove the tube for a good rinsing. Repeating the same steps in reverse and adding water instead of dumping the water out will give you a fresh new setup. Check out the video below which will give you an good idea of how the Hydrology9 operates. The Hydrology9 has made it into our top picks for the best portable vaporizers in the ﻿$250 and lower category. Overall the Hydrology9 is one of the most innovative portable vaporizers available to date. The build quality, vapor cleanliness, and customer service is all top tier. You can get one of these popular selling devices directly from Cloudious9's official website here.